GEORG TINTNER was born in Vienna in 1917. He began studying piano at the age of six and to compose soon after. From nine to 13 he was a member of the Vienna Boys’ Choir, after which (at 13) he entered the Vienna State Academy, where he studied conducting with Felix Weingartner and composition with Josef Marx. He became Assistant Conductor at the Vienna Volksoper at 19. In 1938 he fled the Anschluss, finally arriving in New Zealand. He went to Australia in 1954 as Resident Conductor of the National Opera and Elizabethan Theatre Trust Opera (later Australian Opera). In 1966-67 he was in Cape Town as Musical Director of the Municipal Orchestra; from there he went to London and Sadler’s Wells for three years, with guest appearances with the London Mozart Players, Bournemouth Symphony, Northern Sinfonia and London Symphony for the BBC. A recording of Bruckner’s Fifth from one of the LSO broadcasts has recently been released on the Testament label. He returned to Australia in 1971, and in the following years held several posts including that of Senior Resident Conductor of the Australian Opera (Sydney Opera House). 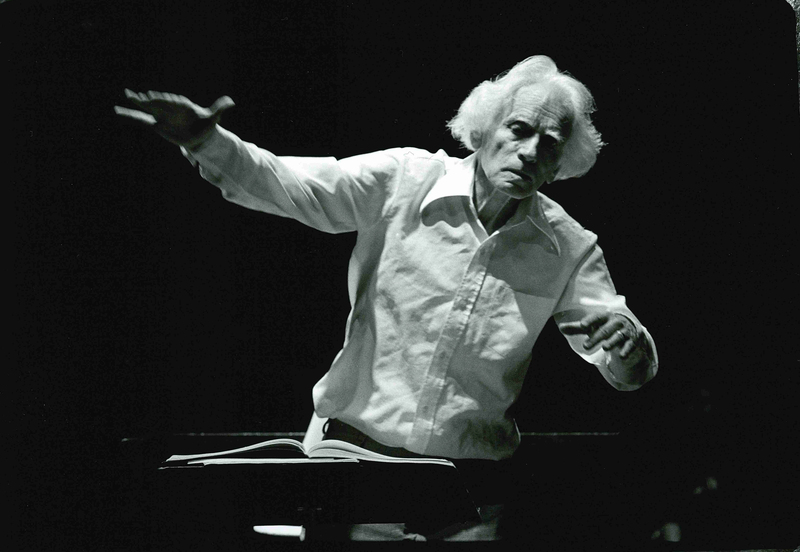 He conducted over 50 operas, about two-thirds of those from memory. In 1971 he was invited as Music Director of the National Youth Orchestra of Canada, a visit so successful it was repeated seven times. This indirectly resulted in his becoming Music Director of Symphony Nova Scotia, a position he held from 1987–93. He also appeared with all major Canadian orchestras, including several appearances with the Toronto Symphony and Montreal Symphony. He conducted regularly at the Sydney Opera House, and in the 1990s taught master classes every year in the Czech Republic. He also appeared many times with all Australian and New Zealand orchestras and opera companies, and with the Michigan Opera Theatre, Canadian Opera Company, Hong Kong Philharmonic and Singapore Symphony. He conducted regularly at the Hong Kong Academy for Performing Arts, and was also guest conductor/lecturer at Yale University in 1997. Georg Tintner began recording the entire orchestral and orchestra/choral works of Anton Bruckner for the Naxos label, mostly with the Scottish National and Irish National (RTE) orchestras, a project left incomplete at his death in 1999. One complete cycle of 11 symphonies was recorded, however, and is widely considered one of the finest Bruckner cycles ever made. Symphony No. 2 was a Gramophone Editor’s Choice; No. 5 was Record of the Month in the British magaine Hi-Fi News & Record Review and No. 6 was declared “the most satisfactory version on record ever” by the Swedish magazine Musik and Ljudteknik. Classics Today named No. 3 CD of the Month and the Daily Telegraph in the UK declared No. 4 a CD of the Year. In 1989 he toured with the Canadian Brass and the principal brass of the New York Philharmonic and Boston Symphony, after which they recorded a CD of Beethoven arrangements for Philips. He also made several recordings with Symphony Nova Scotia for the CBC’s prestigious SM5000 label. He has recorded the 1887 version of Bruckner’s Eighth Symphony (first North American performance) on Jubal Records in Canada, and Bruckner’s Sixth with the Bohuslav Martinu Philharmonic for Deutsche Schallplatten. In 1998 he was made a Member of the Order of Canada, and in 1999 he was awarded the Portia White Prize for cultural and artistic excellence in Canada. In 1993 he was awarded the highly prestigious honour of the Grosses Ehrenzeichen, the Officer’s Cross of the Austrian Order of Merit, and also the Commemorative Medal for the 125th Anniversary of Canadian Confederation; in 1994 he was awarded the Silberne Ehrenzeichen (Silver Cross of Honour) by the province and city of Vienna. He has been awarded three honorary doctorates, by Dalhousie University and St Francis Xavier University in Canada and Griffith University in Australia; in 1995 he was made a Fellow of the Hong Kong Academy for Performing Arts. His SNS recordings on CBC have won Best Classical Recording at the East Coast Music Awards in 1995 and 1998. After his death in 1999 Naxos issued a 13-album Georg Tintner Memorial Edition, which includes 10 CDs of live performances with Symphony Nova Scotia.